David Dana is a leading scholar in the fields of environmental law, property, land use, and professional responsibility. Before becoming a professor, he was a litigator in both the private (Wilmer, Cutler & Pickering) and public (U.S. Department of Justice) sectors. He taught at Boston University before joining Northwestern, and has been a visiting professor at Harvard and Virginia as well several foreign universities. His work on the Takings Clause has been very widely cited, as has his writing on the ethics of aggregate legal representation. His current scholarly work focuses on a range of topics, including environmental and health risks posed by emerging technologies, climate change adaptation, the foreclosure crisis, and attorney fees and fee alternatives. 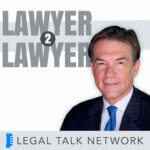 Nadav Shoked and David Dana talk about sanctuary cities, climate change, and federal versus state and local governments in this legal podcast.